BlackRadioIsBack.com Recommended Website: FreeDocumentaries.org | BlackRadioIsBack.com - Official Blog of the Syndicated FuseBox Radio Broadcast! Over here at the blog home of the FuseBox Radio Broadcast, BlackRadioIsBack.com, we're going to start up a monthly section to recommend various websites that we run into in our internet travels. If you are interested in being considered for this section, please feel free to contact us at blackradioisback@gmail.com with the subject header "BlackRadioIsBack.com Recommended Website Consideration". The first website we're going to recommend is FreeDocumentaries.org. This is a great site founded by an up-and-coming non-profit organization where they recieve permission from various directors to stream video up their full documentary films for free to get different information and outreach to the people. Let me state that again: you get to check out full movies, for free, that aren't stupid, with some knowledge base, not boring, on the internet, legally. Nice. The documentaries offered on the site cover various diverse topics such as 9/11, world activism, election fraud, globalization, health issues, human rights, media, war, slavery, the enviornment, social issues and more. For myself, being a big history and sociology sort of person, this site is cool to check out some of these movies I never had a chance to catch up with as well as being a huge free preview site for whether I would like to purchase the DVDs (which the site also provides sales links as well to support) and checking out the origin websites for the documentaries. From the most independent filmaker to the more well known documentary directors and organziations (Michael Moore, Morgan Spurlock, the Guerilla News Network, etc. ), there is a lot of interesting material up on here to absorb, get you thinking (if not agreeing) and spend some time with. You can also recommended documentaries and people for the site to reach out to to keep the momentum going on this project. When you're there and can afford it, since they host the videos on their own dime, feel free to hit the FreeDocumentaries.org folks with a little donation. 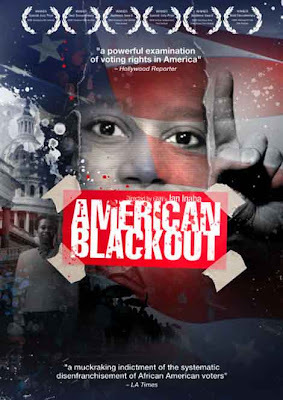 “American Blackout” chronicles the recurring patterns of voter disenfranchisement witnessed in both elections while following the story of Georgia Congresswoman Cynthia McKinney, who not only took an active role in investigating these election debacles but also found herself in the middle of one after publicly questioning the Bush Administration about the 9-11 terrorist attacks. Some call Cynthia McKinney a civil rights leader among the ranks of Shirley Chisholm and Malcolm X. Others call her a conspiracy theorist. American Blackout gains unprecedented access to one of the most controversial and outspoken politicians in America and examines the contemporary tactics used to control our democratic process and silence political dissent. The film features interviews with: U.S. Congressional Representatives, John Lewis, Cynthia McKinney, John Conyers, Bernie Sanders, and Stephanie Tubbs-Jones; former U.S. Civil Rights Commissioner & Dean of UC Berkeley's School of Law, Christopher Edley; BBC journalist Greg Palast; and, Van Jones, Executive Director of the Ella Baker Center. 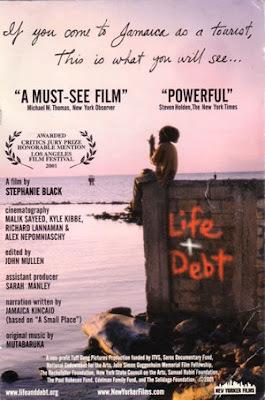 "Life & Debt" is a woven tapestry of sequences focusing on the stories of individual Jamaicans whose strategies for survival and parameters of day-to-day existence are determined by the U.S. and other foreign economic agendas. By combining traditional documentary telling with a stylized narrative framework, the complexity of international lending, structural adjustment policies and free trade will be understood in the context of the day-to-day realities of the people whose lives they impact. The film looks at the role of the IMF and the World Bank in the destruction of the Jamaican economy and the affect of this attempted financial globalization on Jamaican society and its people.